The nutritional value of the dandelion is becoming increasingly understood, yet the number of appetizing ways to use the plant are still rare. While the flowers are not the richest source of nutrients compared to the roots and leaves, they do contain some health benefits, including antioxidants and vitamins A and B12. For more about the flower as a food source, this article is worth reading. 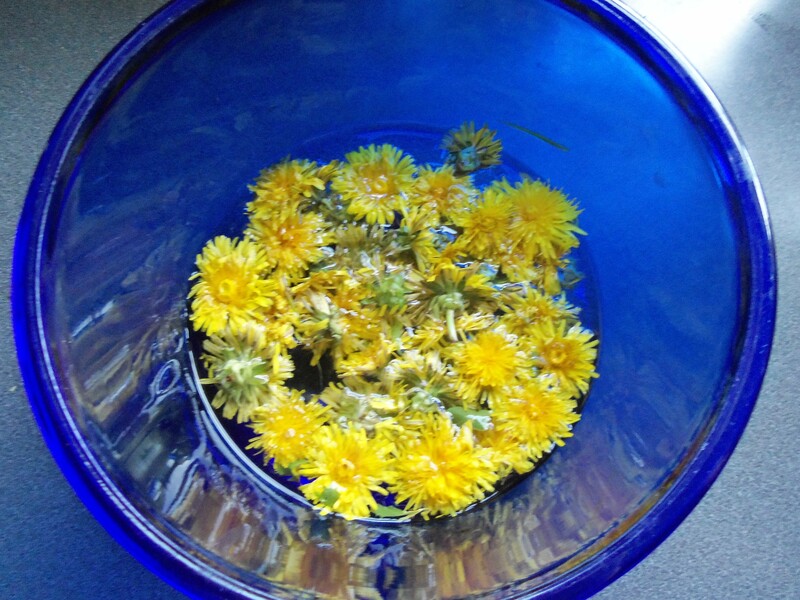 I just finished making a syrup from dandelion flowers which I found so good I already have a second batch on the go. I have used it to make a cocktail and a sourdough fruit bread, adding some to the batter as well as a glaze when it came out of the oven. The recipe in this post was inspired by a recipe for revani, a Greek cake soaked in syrup after baking. I found this recipe in my newest cookbook called “Three Sisters – Back to the Beginning” by Betty, Eleni and Samanth Bakopoulos which I noticed has just been shortlisted in the Taste Canada awards. Their cake calls for coarse semolina, which I substituted with casava which has a similar texture, but either can be used. It also calls for orange and lemon zest, but of course I didn’t need those with my own fresh and local dandelions, both in the form of petals and syrup. It makes a pretty dense cake, something like cornbread, and is sweetened mostly by the syrup which is poured over it right after baking. The cake could have absorbed more than the cup of syrup I used, so if you want a really sweet dessert, add another cup. Cream the butter with the sugar and petals. Add the eggs, one at a time and beat well after each addition. Mix the dry ingredients together and add to the batter, beating well. Pour into a greased 9 inch square pan and bake at 350 degrees F. for about 30 minutes. Remove from the oven and immediately cut it into serving size pieces. Pour the cooled syrup over it slowly, letting it be absorbed by the hot cake gradually. Categories: baking, dessert, edible flowers, foraging | Tags: casava flour, dandelion flower cake, dandelion flower syrup, dandelion flowers, Fiesta Friday, foraging, revani recipe, semolina | Permalink. With all the rain we have been having lately the fields are greener and more lush than ever – and that means the dandelions are at their absolute best. When I first started this blog four years ago this month, I had only a few ideas on how to use them in cooking, but in that time I have found they are a lot more versatile than I had imagined. I have been using the roots, buds and leaves, but today I decided to share a recipe I devised using the flowers. I am very pleased with the results, and more so because it is such an easy method for making a delicious floral syrup. A few minutes of picking the flowers and little else, as there is no need to separate petals or do any more than wash them. Using 4 cups of flowers, I let them stand with 2 cups of sugar overnight or up to 24 hours. This will extract quite a bit of liquid from them just sitting there as you can see in the pictures below. At this point, I added 1 cup of water and heated the mixture to a boil, allowing it to boil for about 1 minute. I then strained off the liquid through two layers of cheesecloth into a sterilized jar and ended up with almost three cups of syrup. The consistency is like that of maple syrup, the flavour sweet and floral. It can be used as any syrup would be, as a sweetener for drinks, fruit salads, baking, glazes, etc. A new and original recipe using this syrup will follow within a few days. 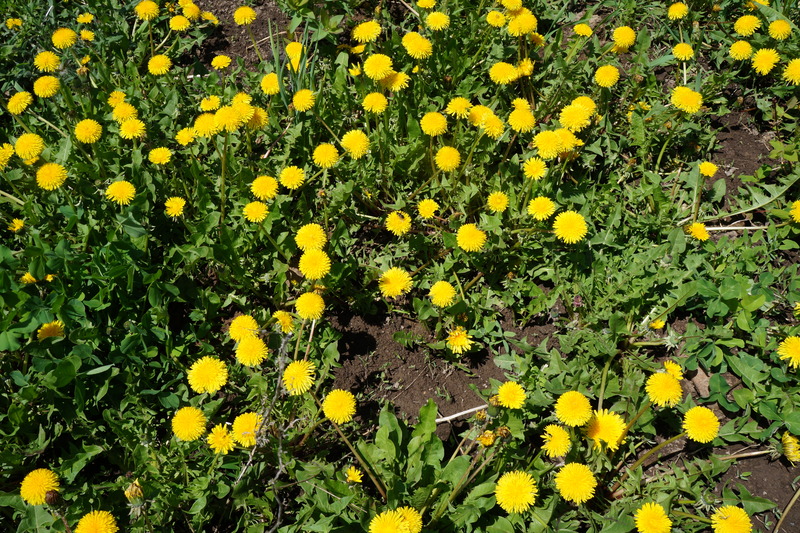 Categories: edible flowers, foraging, preserving | Tags: dandelion flowers, dandelion syrup | Permalink. Here is a seasonal and tasty take on the classic French madeleines. Just add a few petals from everybody’s favourite spring flower to a simple cake recipe and voilà! I have made many variations of madeleines in the past. A simple batter of butter, eggs and flour, plus whatever flavouring you like, be it vanilla, lemon, lavender or chocolate makes a perfect treat to have with your tea. As I’ve recently come across recipes using dandelion flowers in muffins and quick breads, I thought why not make something just a bit fancier. A couple of pointers on this recipe. You will need just the petals of the flower. Snip off the base and remove as much of the green as possible. Usually I find a few specks remain, but that is not a problem. If you have a madeleine pan, all the better. If not, small muffin tins could be used. The batter should be well chilled before baking, as should be the baking tin. This will give you a better shape with the distinctive hump which gives it its form. Mix the petals and sugar in a food processor. If not using a food processor, chop the petals as finely as possible. Add the flour to the petals and mash with the back of a spoon to avoid any clumps forming. Beat the eggs and vanilla well and add to the dry mixture. Blend in the melted butter. Cover the batter and chill in the refrigerator for at least one hour and up to 24. Grease the baking tin liberally with butter, then place in the freezer to chill it well. Spoon the batter evenly into the pan. Bake at 350 degrees F for about 30 minutes. When ready, the centre will be firm and bounce back when pressed. Best eaten warm, and within two days of baking. Serve plain or with a light sprinkling of confectioner’s sugar. You may be wondering about the flavour. There is no bitter taste at all – just an aromatic floral flavour. It is comparable to the delicious scent of a spring lawn covered in dandelions – something that I experienced this afternoon as I happened to be cavorting in the garden. Linked to Fiesta Friday #118, Life Diet Health and GFLife 24/7. Categories: baking, edible flowers | Tags: dandelion flowers, Fiesta Friday, foraging for dandelions, madeleines | Permalink. There is little time left to collect dandelion flowers this year. My spectacular crop is quickly going to seed, especially those plants which have been left unmowed, and which now exceed the typical maximum height of 45 cm. I was however able to collect a bucket full today from the mowed areas to make the season’s last batch of my new favourite summer drink – dandelion gin fizz. There is no need to give descriptions of this plant for purposes of identification – if you have them anywhere in your area, you already know them. As for foraging, just make sure that they are picked only in clean areas, free of pesticides and other chemicals, or contaminated run-off. Around parking lots, train tracks, heavily travelled roads and polluted waters are to be avoided. Roots, leaves and flowers are all edible. In fact, it is a common culinary and medicinal plant in many parts of the world. For more on the benefits and contraindications, check this post. Unfortunately, its uses and benefits are still relatively unrecognized in this part of the world, which makes it a great source of experiment for curious cooks. Which brings me back to my bucket full of flowers. 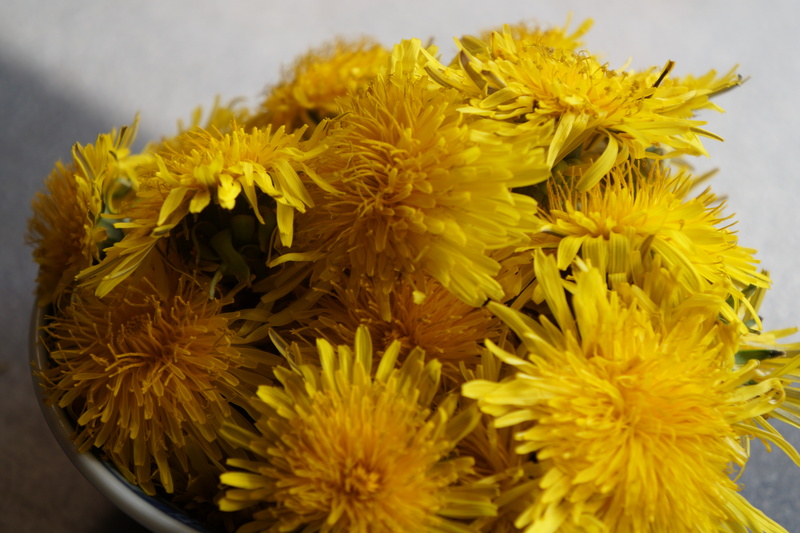 Last year, at about this time, I wrote my first post on dandelions, including recipes using flowers for dandelion pakoras and syrup. 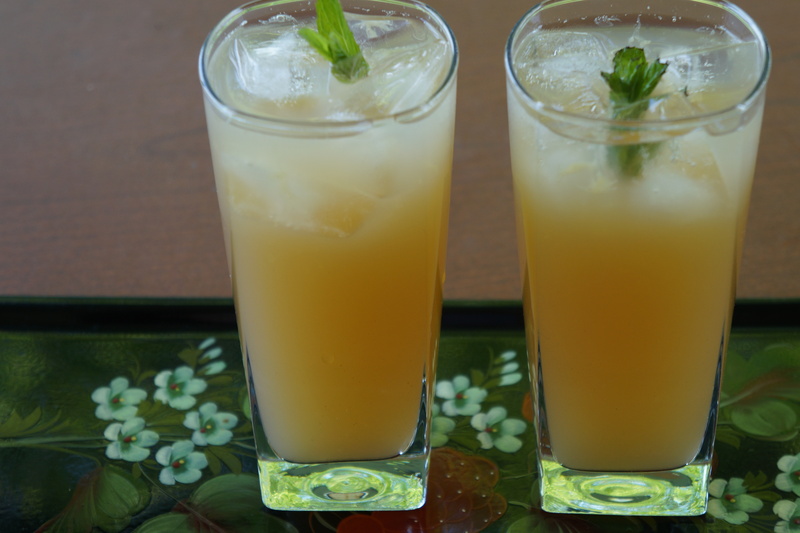 Since then, I have come across a few recipes for lacto-fermented soda, such as this one and of course I had to try it. It is easy, economical, and full of all those wonderful pro-biotics found in fermented foods and drinks. I was also intrigued to think that this could be a home-made soft drink. I am not a fan of the overly sweet commercial fizzy drinks, with the exception of tonic water for my G&Ts, which despite its grown-up bitter flavour, has as much sugar as the worst of them. So I was thinking along the lines of a good gin and tonic type drink as a post-gardening/weeding refreshment. I made this one with whey as a fermenting agent. For the whey, you can strain some natural, plain yogurt through a sieve lined with cheesecloth. You don’t need much, and it keeps in the fridge for at least a week, and can be frozen. My next batch I will make with a dandelion bug, that is, a fermenting agent made with edible root, water and sugar. Most ‘bugs’ are made from ginger, but in fact any edible root works – so why not a dandelion root? To get a clearer idea of what I am referring to, check out this post for a ginger bug where the process is clearly explained. 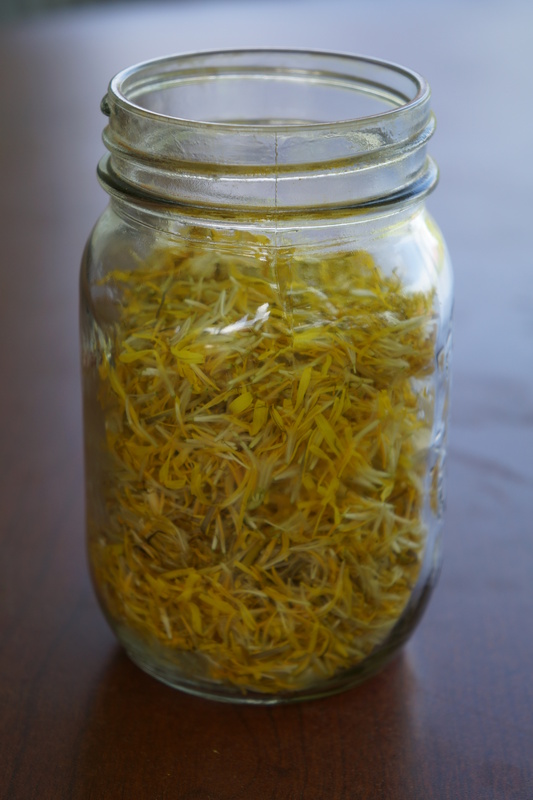 Fill a clean mason jar about 3/4 full with dandelion petals – only the yellow part. Cover with boiling, filtered water and let stand for about 24 hours. Strain the mixture, and squeeze out all the liquid you can from the petals. For every cup of juice, ad 1/4 cup whey and 1/4 cup sugar syrup (made from heating until sugar is dissolved 2 parts sugar to 1 part water). Cover the jar with a clean cloth and allow to stand for about five days at room temperature stirring once a day. Small white bubbles will form on the top. If it goes mouldy, then throw it out. When you stir it, check the taste. It will have a dandelion flavour, but should be palatable. Mix the first 4 ingredients and pour into glasses over ice cubes. Not as bitter as a commercial tonic, this drink has a mild fruit taste, something like a pear nectar. The fizziness is lighter than a traditional G&T, but it is every bit as refreshing and satisfying. Categories: alcoholic beverage, edible weeds, recipes, Uncategorized | Tags: alcoholic beverage, dandelion flowers, dandelion root bug, drink, ginger bug, lacto fermentation, sugar syrup, whey | Permalink. I have often hoped to come across a recipe for floral drinks such as the ones found in Swedish shops (or Sweden). I just discovered dandelions do the trick very nicely. I made a syrup first, then diluted it – every bit as good as elderflower etc. I am sure it can be used equally well for cocktails or toddies, but for now am just using it for a tall summer non-alcoholic drink. Wash the flowers and remove the petals. Cover them with water, bring to a boil for no more than a minute, then remove from heat and leave them to steep overnight. The next morning, strain the liquid and discard the petals. Add the lemon juice and the sugar, bring to a boil and then simmer for about an hour and a half. Mix one part syrup to four parts water. Categories: recipes | Tags: beverage, dandelion flowers, dandelions, drink, drink recipes, edible flowers, recipes, syrup | Permalink. Welcome to my blog. I have created this to explore some of the wild things I have growing on my property, ingredients seldom found in the grocery stores and markets, and often mowed or thrown on the compost heap. So many of these edible weeds are plentiful, nutritious, and offer an inexpensive alternative to imported and store-bought produce. My first thought was to focus on wild grapes and their leaves. However, they are still not ready to be picked in this area, so I shall begin with the humble dandelion. Rather than be irritated by their persistance and size, I began to experiment with the flowers, roots and leaves in my cooking. It is somewhat labour intensive, but at least I end up with very fresh, organic and free ingredients. If you have young children around, I recommend ‘allowing’ them to help you. If you are skeptical about eating the flowers, unless you suffer from ragweed allergies (the same family) or if you have a history of gall bladder problems, you might wish to avoid these or consult your doctor. Otherwise, most people find the honey sweet taste of the flowers surprisingly pleasant. If you are still not persuaded to try them, note that they are high in anti-oxidants, contain vitamins A and B12, and have long been considered a remedy for headaches, backaches and cramps. The first recipe I am sharing is for dandelion flower pakoras. This is an interesting variation of fritters, and this batter can be used with almost anything edible. It is so simple and quick to make, it hardly deserves to be a called a recipe. Pick about 1 cup of dandelion flowers. Wash gently, and remove the top of the stem right under the flower. If you remove too much, the flower will fall apart, but the loose petals can be used in the batter along with the whole flowers. Mix the chickpea flower with the salt and chili. Stir in the water until you have a smooth batter. Dip the blossoms in the batter. Remove each batter-coated blossom with a spoon and fry in vegetable or coconut oil until brown and crispy. Serve warm, as is or with a condiment such as chutney, tamarind sauce, or even ketchup. And now for the dandelion greens. These are often used when young in salads, but why stop there? They are a good source of calcium (even more than kale), iron, high in vitamins A and C and are a source of vitamins E and K. They are often used in detox recipes, contain all essential amino acids and are 14% protein. Blend all ingredients in a food processor, adding the greens a bit at a time. Serve with pasta and add some freshly grated parmesan. Or use it as a base for a pizza. Freeze any leftovers. 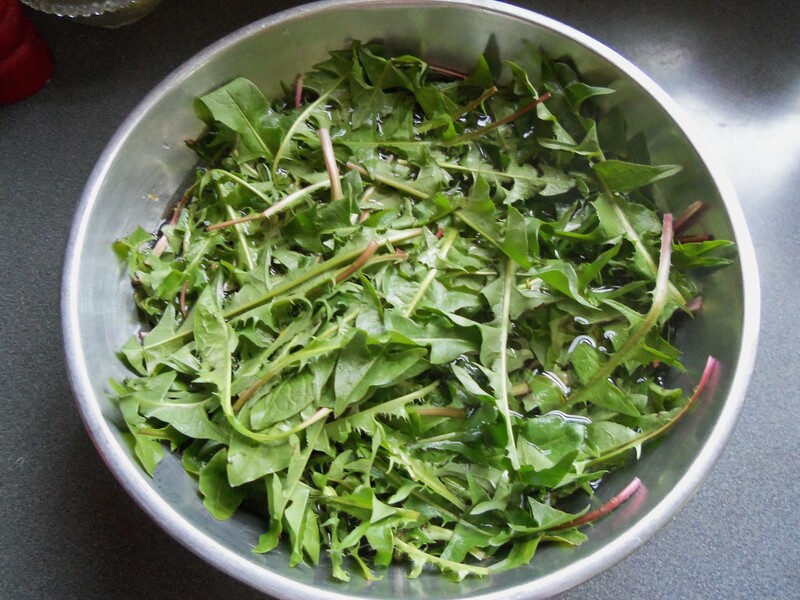 Categories: recipes | Tags: alternative, cooking, dandelion flowers, dandelion greens, dandelions, edible flowers, food, gardening, healthy, pasta, pesto, recipes, vegetarian | Permalink. All my recipes have been tested and tried by me. However, it is each person's responsibility to ensure proper identification before consuming any wild edible. It is also advisable to try any ingredient in small amounts in case of adverse reactions. Always forage responsibly and only in areas safe to do so and without trespassing.